The Designation of Origin “Aceite del Bajo Aragón” is located in the north west of Teruel and the south west of the province of Zaragoza, a geographical area that is one of the largest olive-oil producing areas in the north of Spain. 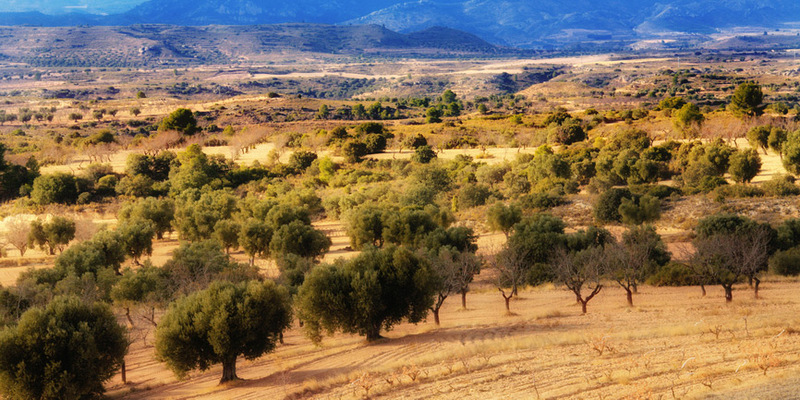 It occupies a cultivated area of 37,000 hectares, with an average density of 70 olive trees/ha, and is comprised of 77 municipalities. The list of municipal areas included in the D.O. Aceite del Bajo Aragón are: Aguaviva, Alacón, Albalate, Alborge, Alcañíz, Alcorisa, Alloza, Almochuel, Almonacid de la Cuba, Andorra, Arens de Lledó, Ariño, Azaila, Beceite, Belchite, Belmonte de San José, Berge, Bordón, Calaceite, Calanda, Cañizar del Oliver, Caspe, Castellote, Castelnou, Castelserás, Chiprana, Cinco Olives, Cretas, Crivillén, Escatrón, Estercuel, Fabara, Fayón, Fórnoles, Foz- Calanda, Fuentes de Ebro, Fuentespalda, Gargallo, Hijar, Jatiel, The Cerollera, La Codoñera, La Fresneda, La Gata, La Ginebrosa, La Mata de los Olmos, La Portellada, La Puebla de Hijar, La Zaida, Lsa Parras de Castellote, Letux, Lledó, Los Olmos, Maella, Mas de las Matas, Mazaleón, Mequinenza, Molinos, Monroyo, Nonaspe, Oliete, Peñarroya of Tastavins, Quinto de Ebro, Ráfales, Samper de Calanda, Sástago Seno, Torre de Arcas, Torre del Compte, Torrecilla de Alcañíz, Torrevelilla, Urrea de Gaén, Valdealgorfa, Valderrobres, Valdetormo, Valjunquera and Vinaceite. The CRDO “Aceite del Bajo Aragón” was constituted in October 2001. 34 companies are registered in the “Aceite del Bajo Aragón” Regulatory Council. Of the total of 34 currently registered companies, 60% are cooperatives and 40% private olive oil mills. The cultivation of this product extends over a very large area of 37,000 hectares, belonging to 77 municipalities in Teruel and Zaragoza. The varieties of olives with which the oil protected by this designation is made are Empeltre, Arbequina and Royal of the species Olea European L.
8,000 families make their living from Oil. 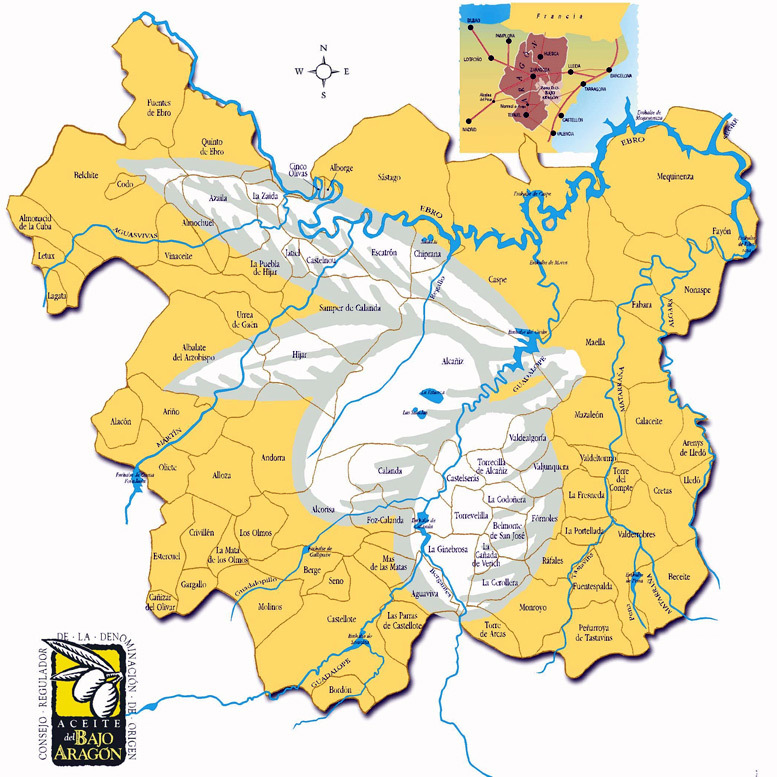 The Designation of Origin covers the Teruel and Zaragoza areas of Southern Aragon and Campo de Belchite. YEAR 2002-2003 production of 950,000 litres of oil with Designation of Origin. YEAR 2003-2004: the production forecast is 1,200,000 litres.